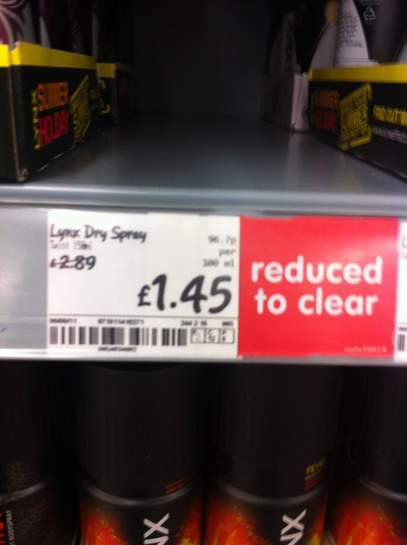 just been to my local asda and seen Lynx Twist Anti Perspirant 150ml reduced to clear. they scanned threw with no problem. so they might be nationwide. what asda store did you see it in. if thats the case might be a high chance it is nationwide. or may have been llanelli. sure i've seen it somewhere! I use Old Spice. I declare myself the winner. Great if your 14 yrs old & spraying yourself with cheap ****! Or you could buy a decent deo? Not voted cold, as it's cheaper than other places. Old spice is still far better than this crap. I tend to use ones with very little/mild scent (normally Sanex), as I'd rather wear a nice fragrance than a deo spray. "Are you wearing Lynx?" "Well smelt!""Voodoo! ""Java"
"I'd like to see you sweat over your work like I do mine." "Well I don't because I wear Lynx Africa, gonna cane me?!" voted cold cos there's none frickin left!!! what you voted coild as theres none left in the picture or at your store. I've yet to smell a 'lynx' that doesn't make me feel like throwing up! Cold! This Lynx twist smells really nice. it's nothing like the other ones which catch in my throat and make me feel sick. I hope they're not discontinuing this one or my son will go back to smelling yucky again with the other ones. To fatabelly, why post at all if youre just going to be rude and negative. Maybe you need to go read what this site is actually for. This Lynx twist smells really nice. it's nothing like the other ones … This Lynx twist smells really nice. it's nothing like the other ones which catch in my throat and make me feel sick. I hope they're not discontinuing this one or my son will go back to smelling yucky again with the other ones. To fatabelly, why post at all if youre just going to be rude and negative. Maybe you need to go read what this site is actually for. Hi still full price in leicester . Not rude just fact... Lynx is crap, and nothing like good antiperspirant and good aftershave. Maybe you prefer your men to smell crap....that's fine for you but not for most.